Up until recently, I've really only let my boys watch warm fuzzy kid shows. About as edgy as we get is Willy Wonka and the Chocolate Factory (the original, of course!). I'm all too familiar with the studies on television violence and kids. But for some reason, the exception I am willing to make is Star Wars. It's like a right of passage for little boys to love Star Wars. Goodness knows I was subject to watching Return of the Jedi some 5 million times while my younger brothers happily repeated every line through their action figures. I don't care for the newer Star Wars, but we do have the three originals on dvd. The other day I broke down and let the twins watch one of them with Pierce. And ever since, all I've heard about from Reid is, "I want to watch Star Horses and Jabba in the Hutt!" I think he liked it a little too much, especially for a three year old. So I haven't allowed him to watch it again since then, but I think I'm in trouble. We have two Star Wars toys of my brothers' that somehow ended up at our house. Pretty sure I'll need to return them once their own kids get into Star Wars, so I'll have to keep my eyes open for more action figures. Sadly, it seems no one ever wants to part with their Star Wars goodies, because I never seem to see them in thrift stores or at yard sales. In the meantime, I'm pulling out my hair enjoying the great many fights the boys are having over sharing Jabba in the Hutt. How about you, reader? Are you a Star Wars fan? Which one is your favorite? There are some great lessons taught in the original Star Wars Trilogy. I love it !!!! Have a great day !!!! How cute is that, Star Horses? I have 3 sons and a huge Star Wars fan for a husband. Superhubby has all the movies and many toys from his childhood which are played with and then others that are still in packaging in his toy room, ahem "man cave." I have attempted to sit through the movies as many times as he has watched them and they do have some valuable lessons for the kids, you gotta love Yoda. The kids prefer the animated series The Clone Wars that comes on Cartoon Network to the live action but yea I am surrounded by Star Wars and you might see our family of 5 dressed up as them for Halloween. I like the one with the Ewoks in it, yea I am bad, couldn't tell you which movie it is. JDaniel and my husband watch Clone Wars on YouTube often. Then they have light saber battles. Yes, they both have one. My husband started the Star Wars obsession with my son when he was 2. We have so many Star Wars toys. Sadly, over the past few months, he has moved on to other toys. He does like the movies, though! Ha, I think you are in trouble Lisa. The Star Wars thing may be with you all for a long time. Our older boy liked it, but he is not a big fan or anything. As a young kid, he did really enjoy the Star Wars Lego video game though. The only one I've seen for sure is the original first one, and I loved it. I was a teenager when it came out, and I remember thinking I wouldn't like it, but I did. My husband is a huge Star Wars fan. I never watched it growing up. We rarely watched any movies unless they came on regular TV growing up. So,I decided to watch the first new one that came out. You know the one with Jar Jar Bing (is that right)? Well, it was horrible! I have not been able to bring myself to watch any others because of that one. The hubby keeps telling me that one was horrible and that I should watch the originals. Maybe I'll give them a shot one day. i watched 'em but never was too thrilled. my nephew was a HUGE fanatic and collected all the stuff he could get his hands on. probably worth a pretty penny if he still has 'em. 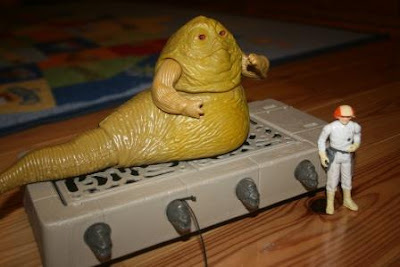 That Jabba character frightened me to death...he's really creepy. I took my girls to them when they did the redo.They din't sink into the trilogy as well as me. My boys are into Ghost Busters (only 1 of them, the other 1 is too scary). They also like Back to the Future. They've only watch the 1st one of that series. LOVE Star Wars here--and the first is my favorite. Happily, my kids haven't outgrown it either thanks to Lego! My Daughter used to have every character there was.... that was years ago. Not sure what happened to them. Awww, so cute! I have to admit I am not a Star Wars fan. I remember by brother forcing me to watch one (I don't even remember which it was) and I was so bored! Just not my thing. Of course the original Willy Wonka, it's the best! I loved the Star War movies. I'm not sure which I loved the best. I haven't watched those in a very long time. Sounds like a winner with the boys! Neither my kids or I ever really got into the Star Wars stuff, not sure why. And I grew up with it being very popular. This is HILARIOUS!!!! The thing I miss the most about kids growing up is this. Their words not quite right making them say such funny things, Be sure and wright it all down. The Star Wars toys are huge collectibles and people pay big money for them the older they are! You are right....boys and star. Wars go together. I saw the original star wars at the theater, nothing can compare to seeing it there. Long ago and far away I guess. I have been a Star Wars fans for years 0 decades actually - and I think the Star Wars figures are going to become quite valuable. That must be so much fun for the boys. I am not a fan of Star Wars. I bet you can find the figures on Ebay. Lisa! Oh! I am the biggest dork. As soon as I get the repair done on (?) then I will do a post of my prize. I am such a dork. Forgive? yes? Rock artist Rick Springfield is a serious Star Wars fan and memorabilia collector, along with a friend of mine who is 40. I've never really watched the first three, but intend to. A very nice post. Happy New Year, Lisa! Many of the Star Wars toys are worth more years later than they were new. The movies have held up well in popularity.